Thankfully the overnight rain had stopped although the temperature is really dropping now & I had my first white fingers of the tour. I did the 76 miles from Melk to Vienna staring with a climb out of Melk before a steep descent back onto the Danube which today was squashed between hillsides covered in vines and fields of orchards. All very pretty and as a reminder that the Danube is not always so placid all the villages were surrounded by 1 metre high concrete wallls with spaces to slot in metal barriers when the river rises. 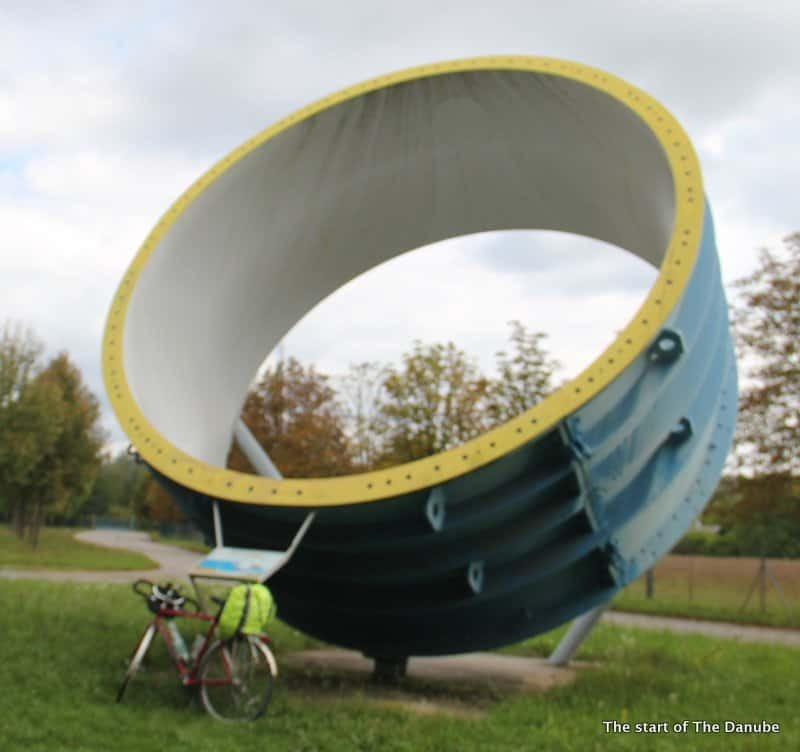 One of the hydroelectric plants had displayed a water turbine housing, enormous just look how tiddly my bike looks! Bit see the power it generates . 39,000 kW from a 14 metre head of water! There were two more coal/oil power stations closed down as well. With one of them proudly displaying on a LED display its solar generation capacity, it was showing 84kW or 0.2% of the water turbine! I saw several cruise ships mainly going up river, none seemed very busy, so I guess the season must have ended. I eventually reached Vienna making me 1/3 of the way down the Danube, I passed the 2,000km to The Black Sea marker today. I think the battery on my Wahoo bluetooth cadence sensor has packed up so the Strava data is now limited to GPS & the heart rate monitor. However, I did go out and buy some new Adipure V22625 lightweight running shoes to replace the Saucony ones. Laufsport is totally dedicated to running situated on the first floor with only a discrete door & bell it was a world away from any UK high street sports place! I also took a look at the Hammam but it was ridiculously expensive so I will wait to Budapest or maybe Bratislava.